The Banded Trochus Snail is touted by aquarists of all experience levels for numerous reasons. Like other members of the Trochidae family, the Banded Trochus is easy to care for and very adept at working as your aquarium’s cleanup crew. The Banded Trochus Snail normally has a black foot that is an off white/tan color on the underside of the foot. It boasts a pale gray, top- or pyramid-shaped shell. Thanks to the maroon stripes or bands on its shell, the Banded Trochus Snail adds a unique flair to any marine system. Also known as the Trochus, Turban or Top Shell, or Turban Snail, this species of the Trochus genus is the true Banded Trochus Snail from Indonesia. Perhaps what many aquarists appreciate the most is the ease with which Banded Trochus Snails seem to breed in the home aquarium. It reproduces sexually by releasing gametes into the water column. The gametes appear as a cloudy, white substance. Breeding activity is usually sparked by changes in lighting or water conditions. After the gametes join, they develop into free-swimming larvae that eventually settle into your aquarium substrate and develop into mature snails over a period of a few months. 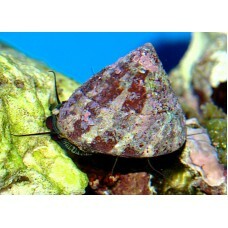 The Banded Trochus Snail is well suited for reef aquariums. As a general rule, you can keep one snail for every two to three gallons of aquarium water. The Banded Trochus Snail is very peaceful and because of its shell shape, it is not easily eaten by crabs. Unlike its close relative, the Tectus Snail, the Banded Trochus Snail can right itself when knocked over. The Banded Trochus Snail does best in a well-established aquarium with ample hiding places and room to forage. It naturally feeds on algae, cyanobacteria, and diatoms amongst your live rock, substrate, and aquarium glass. The Banded Trochus is also an effective film algae eater. However, they only passively graze on other nuisance algae, such as hair algae. Like other invertebrates, Trochus sp. is sensitive to high nitrate levels and intolerant of copper-based medications. It requires a gradual acclimation process, preferably the drip acclimation method. If food levels are insufficient in your aquarium, supplement their diet with dried seaweed. Though most Banded Trochus Snails seem to breed easily, there are no distinguishing characteristics between males and females.